Please tell me this has happened to some of the other quilt bloggers out there. 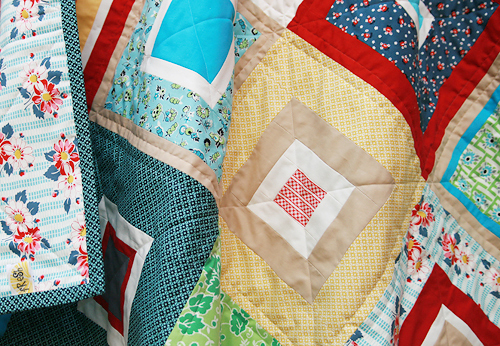 You make a quilt. 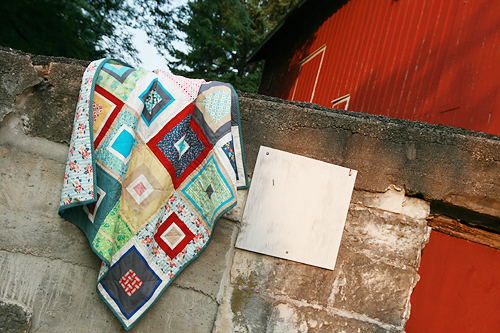 You find the perfect spot to photograph said quilt. Your loving husband drives 15 minutes to the location after work with you, kids in tow, and holds the quilt for many photos. 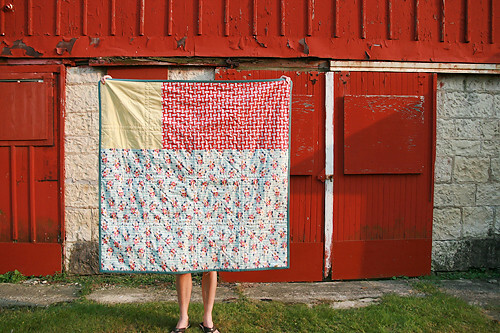 You get home, very excited to see the photos, and realize the quilt was held sideways the entire time (front and back)? 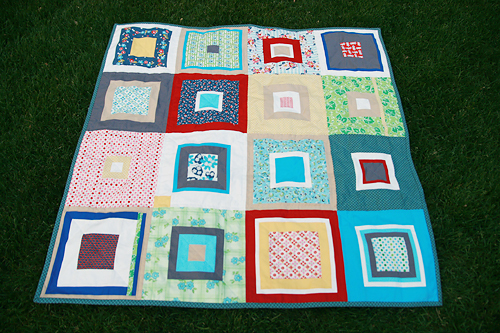 I know there technically isn't a correct direction for most quilts. And no one would really notice. Except me. I do love this quilt though. I used the latest fabric collections by Denyse Schmidt, Picnic and Fairgrounds, found surprisingly at JoAnns. Did you hear she has another collection coming out there later this summer called Sugar Creek? Can't wait! I started these blocks shortly after buying the fabric. Each block focuses on one of the 16 prints I bought from the collections. There are a couple small exceptions for added interest, but not many. I then used a variety of Kona solids from my stash. The back (also sideways in this photo - yellow should be top right) contains mostly my favorite print in the collection, Picnic - Floral on Texture. I also included Modern Texture in yellow and Modern Ditzy in red. The binding is Modern Texture in blue. I quilted it with straight lines, about 1/2" from the side of the block seams and then diagonal through the blocks as well. I really love the colors in this collection. 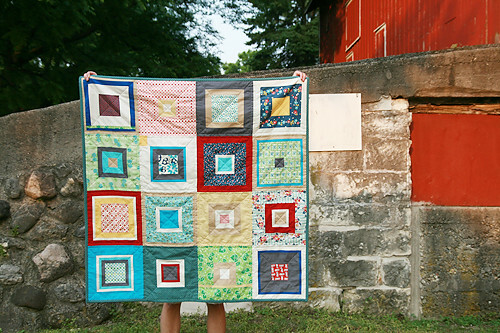 They are right up my alley, thus earning this quilt a prime spot hanging on the wall in my sewing room. Now I can look at it all the time.